This set of Advanced Molecular Biology Questions and Answers focuses on “Activators and Repressors Participate in Positive and Negative Regulation”. Explanation: An operon is defined as a functionating unit of genomic DNA containing a cluster of genes under the control of a single promoter. Thus the two ends of an operon are marked by the promoter and terminator. Explanation: The pioneering studies of gene regulation in E. coli were carried out by Francois Jacob and Jacques Monod in the 1950s. These investigators and their colleagues analyzed the expression of enzymes involved in the metabolism of lactose, which can be used as a source of carbon and energy via cleavage of glucose and galactose. 3. Presence of lactose itself induces the production of β-galactoside transferase. Explanation: The enzyme that catalyzes the cleavage of lactose that is β-galactosidase and the other enzymes β-galactoside transferase and β-galactoside permease involved in the lactose metabolism are expressed only when lactose is available for use by the bacteria. Otherwise, the cell is able to economize by not by not investing energy in the synthesis of unnecessary RNAs and proteins. Thus lactose induces the synthesis of enzymes involved in its own metabolism. 4. How many enzymes are produced in the lac operon under the same promoter? Explanation: A total of three genes are transcribed thus producing 3 distinct enzymes under the same promoter in the bacterial lac operon. The three enzymes thus produced are β-galactosidase, β-galactoside transferase and β-galactoside. 5. Defects in which regions can affect the activity of the lac operon? Explanation: On the basis of purely genetic experiments, Jacob and Monod deduced the mechanism by which the expression of these genes was regulated. Studies of mutant that were defective in regulation of these genes identified in two distinct loci, called o and i, which control the expression of the operon. Transcription of the operon is controlled by o, which is adjacent to the initiator site. The i gene, which is not physiologically linked to the operon, encodes a repressor protein that regulates transcription by binding to the operator DNA. 6. If the lac operon of the genome of bacteria is always active it has a defect in which region of the operon? Explanation: Mutants that fail to make a functional i gene product result in constitutive expression of the operon even when lactose is not available. This result implies that the normal i gene product is a repressor, which blocks transcription when bound to o. 7. Lac operon follows a trans-acting control mechanism. Explanation: Regulatory sequences like the operator are called cis-acting elements, because they affect the expression of only linked genes on the same DNA molecule. On the other hand, protein like the repressor can affect the expression of genes located on the other hand; proteins like the repressor can affect the affect the expression of genes located on the other chromosomes within the cell. The lac operon is an example of negative control because binding of the repressor blocks transcription. 8. According to the repressor of lac operon which of the following are false? Explanation: The repressor of the lac operon does not bind to the promoter region. It binds to the operator region of the lac operon thus repressing the activity of the lac operon. Explanation: If there is an insertion mutation in the operator of the lac operon the repressor cannot bind to it. Thus the operon is constitutively expressed. Explanation: The complete expression of the lac operon requires allolactose and cAMP. They regulate the expression of the lac operon by a positive control system called the catabolite repression. 11. What effect would a loss-of-function mutation have on the expression of the gene encoding the catabolite activator protein of the lac operon? Explanation: As the mutation occurs in the catabolite activator protein gene occurs which causes loss of its function its protein the activator protein is not synthesized. Thus the operon shows no restrain and is active continuously even when glucose is absent. Even if glucose is present due to the absence of activator the regulation of the operon does not occur resulting in a low expression level. Explanation: In a positively controlled operon the function of the gene is normally active thus no repressor molecules is produced that binds to the operator. Mutation in the regulatory gene leads to the production of repressor molecules that either binds to the operator or the transcription factors thus blocking the function of operon leading to operon repression. Explanation: In the case of lac operon, the gene expression is inhibited by interaction of repressor with operator, as repressor does not bind to lactose. Presence of lactose leads to the interaction of lactose with operator which induces the activity of the operon. 14. Which of the following is false about bacterial tryptophan operon? Explanation: Trp operon is an example of repressible negative regulated operon. In this the operon’s regulatory sequence, the operator is blocked by the repressor protein in the presence of tryptophan. While in the absence of tryptophan the repressor is liberated thus facilitating operon expression. Explanation: The Trp operon has a leader sequence of 14 amino acid long polypeptide. This contains two tryptophan residues at 10th and 11th positions which are very unusual in case of amino acid recruitment. This stretch of mRNA is known as the attenuator sequence. 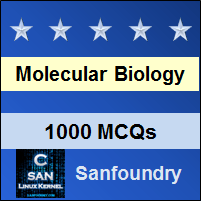 To practice Advanced questions and answers on all areas of Molecular Biology, here is complete set of 1000+ Multiple Choice Questions and Answers.